If ExU isn't using a standard crop interface, it's on them to add support. Because I don't consider it stable enough for a full release. It's safe to use, but still has quirks. What about adding animals stats (time to breeding, genetics for vanilla horses e.t.c.) ? I believe this is added by Wawla already. Go and politely ask Darkhax to update, then. Can you add module for Thermal Expansion (1.10.2) please ? Because when you place Cache for items you can't see how many items is in there ? I'm just curious about this, but I don't know where you're getting your Thermal Expansion from and from what I've looked at, the original dev is M.I.A. and a team is working on pushing out a port to 1.10.2. However, if you have found a working, up-to-date TE and I've just been clicking on the wrong links, could you point me in the right direction? Would be greatly appreciated. As for Hwyla, I've just been looking for a functioning fork/similarity to Waila for hours now. Hoping this one works. Would it be possible to add better industrialcraft compability to it? I tried this mod in the hope of getting to see grow stages of ic2 crops and maybe get to see the inventory of machines with it, but I only get basic WAILA displays for those. I'm not sure how ic2 implemented the stuff, I only do know that they use IFluidHandler for fluids. ic2 has a system where you get unknown seed bags and will only see what they are when you analyzed them, but if you did that then you can even see the stats it has. I was hoping I could see the stats of analyzed crops with this when they are planted since ic2 doesn't have a way to do that, only if you have the seed bag of it. I'm not sure if it can be done but I know of a really big addon for ic2 (gregtech) that has a scanner that can display the stats even planted. Also, would it be possible to change the name and author of this mod that is displayed in the mod options, or at least add a comment that this is HWYLA, not WAILA? I was really irritated and searched for WAILA in my mod folder because I thought I made an error replacing the mod. Only a few minutes of searching and the version number tipped me off that it worked. No, I am not adding support for other mods. That is the job of addons and the mods themselves. No, I am not changing the displayed information. Mobius is the author of Waila and this is Waila. You could leave the author and mod name the same, jsut add a comment that it's the HAWLA fork, so that people are less confused. This is on their end. They need to override getCrop() in their crop class. Alternatively, they can register a handler and return what they want. 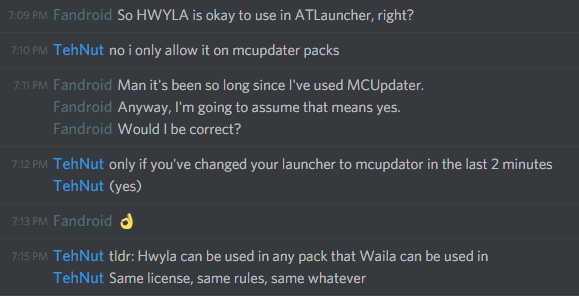 So HWYLA is literally the same as WAILA, but gets updated faster. Am I correct with this notion? As you can see from the description and all the other comments, yeah pretty much. Will this "fork of waila" show the block ID numbers that were visible with older versions of waila? If not, can you recommend a mod that will? I'm referring to the numbers such as 98:0 for Stone Bricks and 1:0 for stone. That used to be displayed on the Waila HUD and still is on 1.7.10 but seems to be missing in 1.10.2 version of Waila. All I see now is the name of the block and "Unimplimented" below. Is it possible that I accidently disabled it?